The Ghoul – Arrow Video – movie + Q&A review! Having appeared in Ben Wheatley’s Kill List and Down Terrace, actor and writer Gareth Tunley is no stranger to the darker side of British cinema. 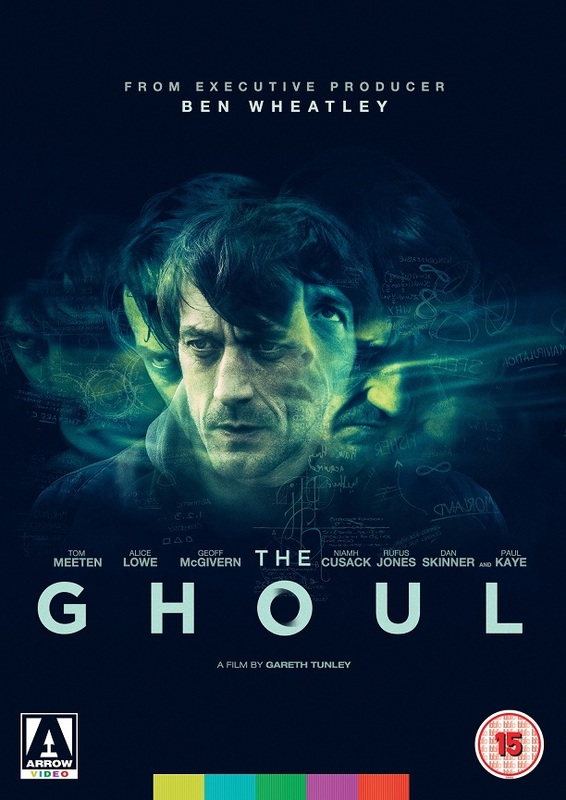 After directing a variety of comedy shorts and sketches, Tunley makes his feature film directorial debut with The Ghoul – a beguiling psychological thriller starring Tom Meetan and Alice Lowe. Now showing in cinemas across the country, Slimehouse TV attended a recent screening of this intriguing indie drama with an accompanying Q&A with director Tunley and producer Jack Guttmann. Here’s our review of this low-budget enigma, along with some of the highlights from the evening’s revealing discussion with the filmmakers. The Ghoul begins with a police investigation into a bizarre double murder. With mysterious and unexplainable circumstances surrounding the crime, a troubled detective Chris (Tom Meetan) goes undercover as a psychiatric patient to learn more about the key suspect’s relationship to their psychiatrist. As he gets closer to the truth, Chris finds himself trapped in a nightmare where fantasy and reality begin to blur into one. 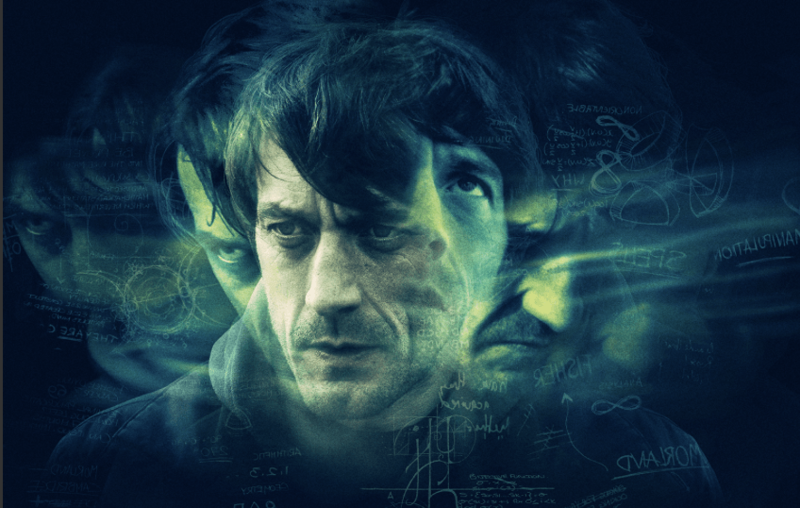 Starting off in the mold of a traditional crime thriller, The Ghoul quickly evolves into schizophrenic mystery where the viewer is never quite sure what’s real and what’s not. It’s a tough film to summarize – not only because of the film’s twisty dreamlike structure, but because Tunley’s film is best experienced cold. It’s the kind of film that benefits from knowing as little as possible and leaves you with plenty of questions to ponder as the lights go up. Filmed on an extremely low budget, Tunley has still managed to assemble an excellent cast that’s surprisingly comprised of actors mainly associated with comedy. Along with Meetan and Lowe (Sightseers), the cast includes frequent Vic & Bob collaborator Dan Skinner as well as a scene-stealing turn by Paul Kaye (Dennis Pennis). There’s also a memorable performance from Geoffrey McGivern as the avuncular psychotherapist Dr.Morland. Tunley manages to develop strong performances out of his self-proclaimed “cast of clowns”. Tom Meetan carries the film with an understated intensity and the scenes between him and Alice Lowe inject the film with some warmth. Sadly, Paul Kaye is only given a short monologue in an otherworldly sequence that leaves you wanting more from the actor who can also be seen showcasing his dramatic chops in Game of Thrones. 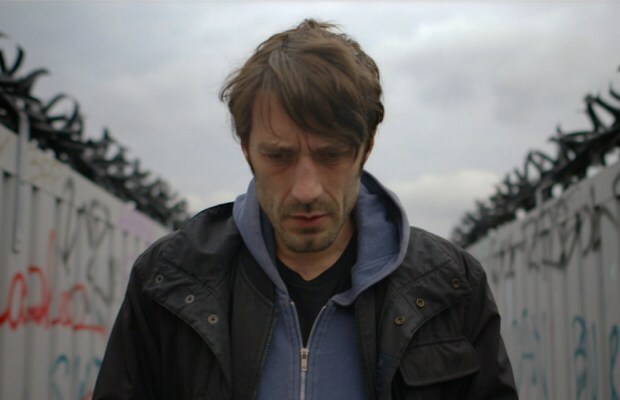 Along with the strong performances, The Ghoul defies its low budget with its striking cinematography that makes use of grimy London locations and drab interiors, which provide the film with a gloomy atmosphere. One of the film’s strongest elements is undoubtedly Waen Sheperd’s moody score, which occasionally evokes Bernard Herrmann’s classic soundtracks for Psycho and Vertigo. With its dreamlike narrative and themes of confused identity, Tunley’s film has also attracted comparisons to the work of David Lynch. Fans of the director will quickly pick up on the similarities between the film’s dreamy sequences of sprawling British motorways and Lost Highway’s tenebrous roads. Ultimately though, Tunley’s film is a very different beast – eschewing the outlandish humour of Lynch’s work, with a social-realist style that befits the film’s underlying themes of depression. It’s not exactly a fun night out then but The Ghoul deserves to be applauded for tackling a tough subject matter in an ambitious way. It’s not a complete success, with occasionally clunky dialogue and a third-act that fails to satisfyingly tie up the film’s web of intrigue. 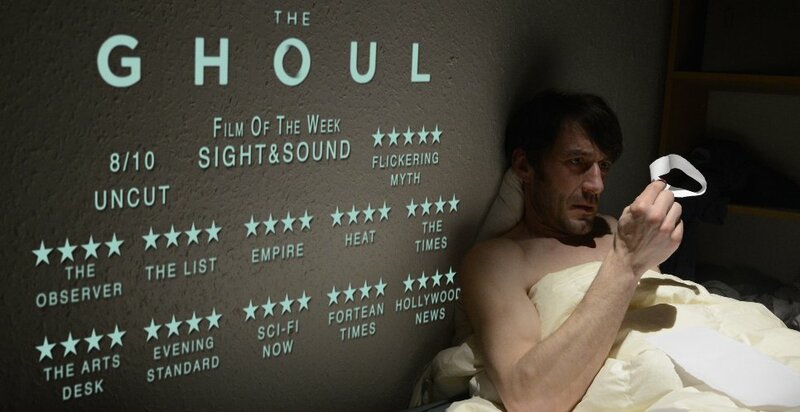 Nonetheless, The Ghoul is an impressive debut and manages to dig its way under your skin. During the Q&A following the film, Tunley and producer Jack Guttmann talked openly with moderator Steve Oram (Sightseers) about the challenges of producing such a complex film on a tiny budget. They revealed how they shot all of the dialogue scenes an astonishingly tight 10-day schedule, as well as some of the ingenious ways they tackled budgetary restraints. One brilliant example was the combination of cheap torches and cling film to create the illusion of passing cars from inside a vehicle. The pair also spoke about the films origins and influences. They cited their love of detective stories as well as the BBC’s nuclear drama Threads, which infamously traumatized an entire generation during the 1980s. It was also interesting to hear that the film’s score was finished while the film was still in production, allowing the cast and crew to use the music to set the scene. The discussion concluded with a discussion of the film’s lengthy journey from production to distribution. Shot in 2014, the film underwent a lengthy editing process where it gained the support of director Ben Wheatley as an executive producer. Following early festival screenings, the film was featured in the 2016 London Film Festival. As it makes its way into cinemas around the country, we’re eager to see what’s next for the director of this ambitious drama. The Ghoul is available from ARROW FILMS from the 4th September 2017!